I woke this morning to learn that Netflix’s CEO had decided to fall on his own sword and rebrand Netflix’s DVD-by-mail feature (otherwise known as Netflix’s primary feature or the feature that made Netflix all of it’s money) to…wait for it…Qwikster. After a botched price hike this summer that alienated hundreds of thousands of subscribers, Netflix has decided to stick it’s thumb in the eye of all remaining loyal DVD-to-mail subscribers by leaving them with the new, unimproved Qwikster. I picture the captain of a luxury cruiser herding his passengers into old lifeboats, setting them adrift in the ocean and then cruising off smirking with the dinner buffet all to himself. Presumably, this is an effort to sell off the DVD-by-mail business and position Netflix to sail into a future of downloaded content without being encumbered by a logistically-difficult “by-mail” business model. Full disclosure: I’ve been a Netflix fan since the beginning. I’ve spent more time than I care to calculate watching discs from Netflix (2,091 movies rated). I’ve learned, laughed and loved with Netflix. I even used to own Netflix stock back during the days when I dabbled in the market. I’ve also been a bit of a Netflix evangelist at times as the company fought off Blockbuster and Redbox. And now Netflix has given customers yet another reason to explore possible alternatives. Since I wrote a blog post about the Indianapolis Public Library’s rebrand a few weeks back, I thought it appropriate to analyze how Netflix’s rebrand meets the guidelines I set forth in that post. 1. At a bare minimum, do a Google search for similar trademarks already in use. To Netflix’s credit, the Qwikster name seems to be relatively unencumbered from a trademark confusion perspective. There are 3 registrations for “Quickster” but in seemingly unrelated fields (Sports training equipment, namely, quick-assembly portable multi-sport practice nets; Jewelry, horological and chronometric instruments, namely, chronometers, watches and parts thereof; Telephone Indexes). Of course, it could be that it’s such an awful name that every business with any marketing sense has stayed away. That being said, availability of a trademark is an increasingly rare trait so Netflix may have jumped on the first available name on their list. Time will tell whether that’s a smart approach to rebranding. However, as Item 2 will discuss, while potentially available for use in commerce, the mark may not be as ready for marketing purposes as initially thought. Also, somewhere else you should check…Urban Dictionary. Have you considered all public connotations before adopting a new trademark? 2. Claim your domain name(s), Facebook, Twitter, YouTube, etc. BEFORE you announce the rebrand. 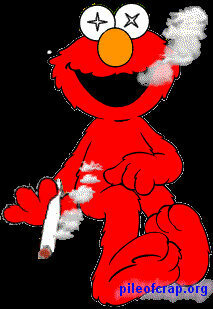 Awesome pic? Yeah, kinda. But is it the image you want connected with your new business as you attempt to convince subscribers to accept not one, but two separate credit card payments each month? Doubtful. If Netflix’s plan is to buy this Twitter account (such a sale is prohibited by Twitter, by the way), I’ll suggest that it would have been accomplished much easier before making a rebrand announcement late on a Sunday night. 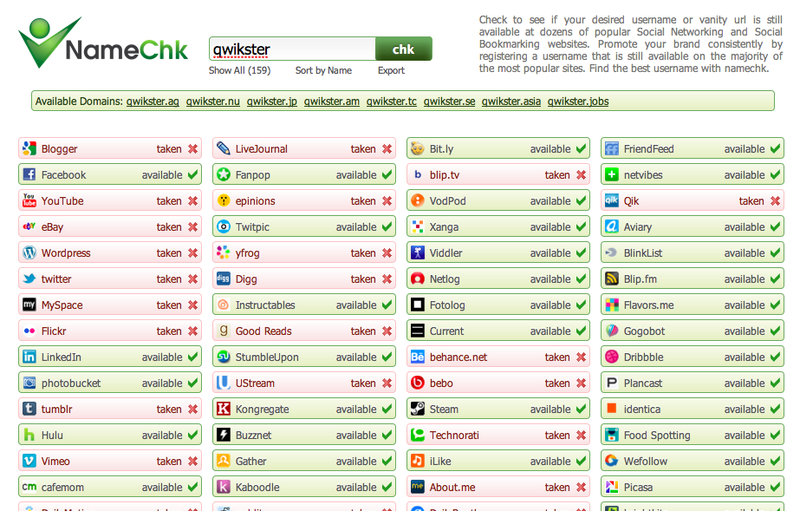 Run a NameChk search before every rebrand…why wouldn’t you? 3. If you’re going to rebrand, then REBRAND! Netflix is blowing my mind here in a whole different way than the Indianapolis Public Library rebrand. The CEO’s late Sunday night, meandering, apologetic blog post hints at the reasons for rebranding but certainly omits key details (drunkenness, plans for a future sale, etc.) As such, legions of current, loyal subscribers are stuck with the awful rebrand while prospective, future customers that don’t yet exist waltz away with the prominent Netflix mark (and NFLX stock quote). Did I mention that each customer will now receive two credit card charges per month (one from Netflix, one from Qwikster) instead of just one? Somehow I suspect that benefits somebody (corporations are people, my friend!) other than the Netflix customer. 4. Always use a proper trademark notice (“TM” for common law rights). Netflix/Qwikster isn’t using a proper trademark notice. Presumably because the CEO made this website late on a Sunday night and neglected to contact his trademark attorney before announcing a major rebrand. 5. When budget permits (ballpark $800-$1200), seek federal registration, thus allowing you to use the registration symbol, ®. Netflix has the budget to be proactive about trademark protection but they certainly don’t appear to have acted wisely in this situation. There has been no federal trademark filing as of yet (even if Netflix won’t be using the Qwikster name for awhile, it should still file an intent-to-use application). I’m expecting there will be a Qwikster trademark application filed today or as soon as Netflix’s attorneys get to the office and realize what has happened. Otherwise, Netflix is playing fast and loose with trademark law in a way that can only come back to haunt it. Thoughts? Like the new name? Hate it? Done with Netflix? Quick…everybody file a trademark application for TIGER BLOOD! That’s the tune Jimmy Buffett is singing as he just filed an application to protect the trademark (which Charlie Sheen recently popularized) in connection with “Vodka” and “Energy Drinks”. But Jimmy isn’t the only one covering that tune as several others have also filed applications in the past few weeks. 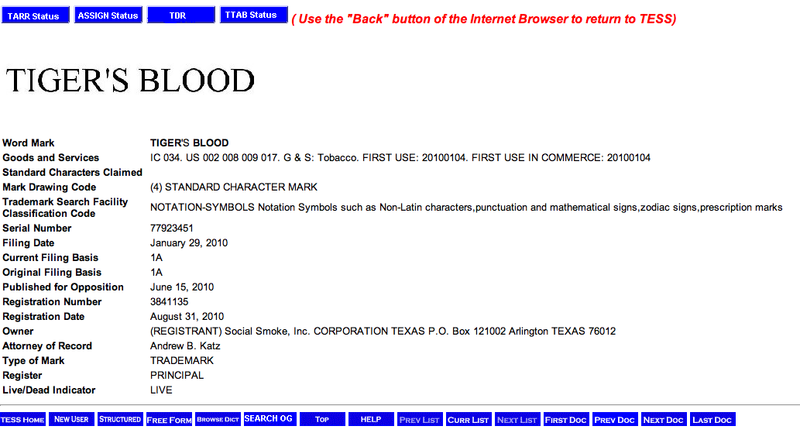 Now the previous owner of TIGERS BLOOD (…it isn’t Charlie Sheen) faces a trademark onslaught of nearly epic proportion. 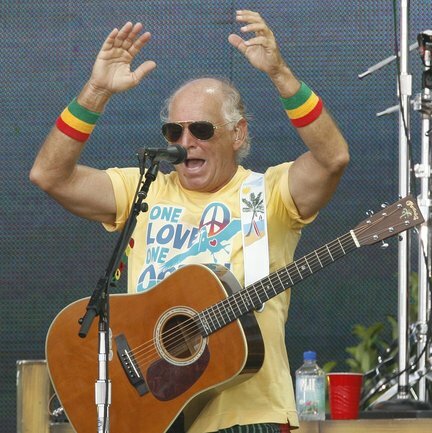 Has a trademark ever had to survive the combined cumulative dilutive and tarnishing effects of Charlie Sheen, dietary supplements and now the boozy bard of Margaritaville, Jimmy Buffett? Which, if any, of the new trademark applications will survive to registration? And how long until Charlie Sheen himself files an application? Never one to miss a beat, even Ol’ Parrothead himself is getting in on the Tiger Blood act. I wouldn’t be surprised if there’s a new “Tiger Blood” single on the radio before the end of Spring Break. 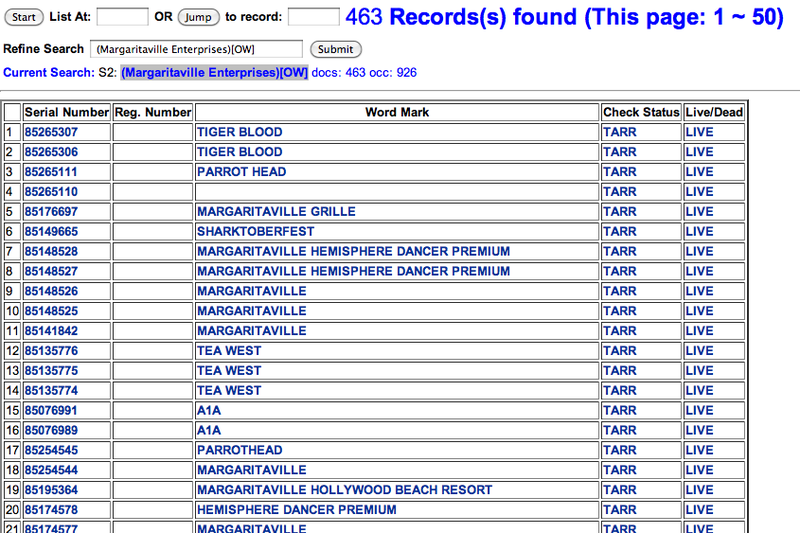 It turns out that someone at Margaritaville Enterprises must get drunk on filing trademark applications…463 filed so far! Are there additional TIGER BLOOD applications to come or is this the end of the trend? I know the trademark attorneys for the two registered marks will need to be vigilant in the upcoming weeks. I’ll keep you updated. The last time Peyton Manning was leading the Indianapolis Colts on a championship run (it’s been awhile), the NFL clamped down on the ability to watch the big game in churches. The NFL sent letters to churches informing them that airing the game would be a violation of the NFL’s copyright and trademark rights. However, two years ago the NFL appeared to call a reverse and allowed viewing in churches under certain conditions. So what’s the NFL’s policy this year? Since there’s been no indication to the contrary, it seems the NFL is sticking to the policy that churches can air the Super Bowl without violating copyright laws. So start planning those parties! For those who don’t know, here’s How to Host a Church Super Bowl Party. David can’t always afford to fight Goliath. Warsaw Community Schools (Warsaw, Indiana) recently received a cease and desist letter from the University of Missouri to stop using their tiger logo. A licensing company determined that it was the same tiger logo as the University of Missouri’s and issued a cease and desist order. A few years ago Warsaw re-designed their tiger to modernize it but claim that they didn’t intend to copy Missouri’s. The logo can be found on Warsaw’s track, trash cans, stationary, staff uniforms, and football uniforms. Even if the logos aren’t identical, are they confusingly similar? Any more so than the other 1,000 Tigers athletics programs out there? Apparently, Warsaw didn’t want to find out and has decided not to challenge Missouri. Instead, Warsaw will be selecting a new logo…a contest will be held among their students to determine the new logo. And perhaps a trademark attorney could run a quick clearance search.